Only little medieval music has survived in Denmark. And all of it is represented on this recording. It could be argued that the value of the existing pieces is emphasized by their rarity, but actually this music deserves to be enjoyed in its own right, as well as being an intriguing historical experience. The music ranges from the earliest known – regrettably unflattering – mention of Danes in music in the 900th century to Danish songs from the 1500th century. 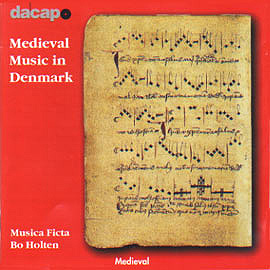 It includes the 13th century Parisian polyophony found in a remarkably Danish source and Danish versions of songs from the international repertory, and thus illustrates both Danish contribution to European music and the musical contacts that Denmark enjoyed with the rest of Europe in the Middle Ages.